Welcome to Cobbly Nob Rentals, the #1 Vacation Resort and cabin rental area in Gatlinburg, Tennesee since 1981. 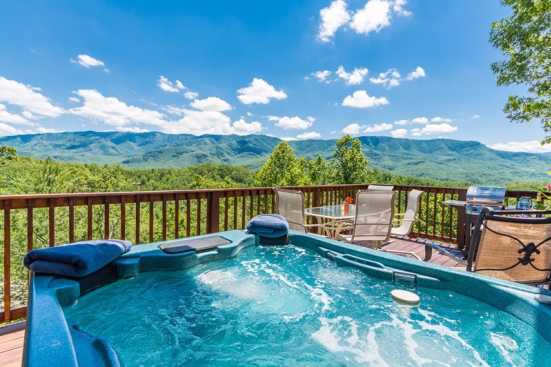 The rental cabins are centrally located in the Great Smoky Mountains and near the Bent Creek Golf Course, the Arts and Crafts Community, and Pigeon Forge. The office assists by offering maps, coupons, and ideas for various attractions nearby. The cabins and chalets are located on a 1,000 acres surrounded by the Great Smoky Mountains National Park. This exclusive resort focuses to ensure a peaceful, quiet, and relaxing experience for every guest. There are over 125 log cabins and chalets to choose from to guarantee the right fit for every individual, family, or small group. Rental sizes range from 1-8 bedrooms to accommodate any kind of getaway. Common amenities include outdoor hot tubs, home theater rooms, high-speed internet, fully equipped kitchens, pool tables, and much more! After enjoying relaxation indoors, the property offers hiking, fishing, whitewater rafting, skiing, and horseback riding in the Smoky Mountains. During your stay at one of these cabin rentals, you will have access to three swimming pools from May until September every year. Be sure to book cabin rental in Gatlinburg directly with the owner on Smokymountainsbyowners.com. Booking direct assures that you will receive the best rate for your trip. Each listing will contain an Email Owner button or Phone Number for you to contact the rental owner directly. Webb Creek Hideaway - Outdoor Lovers!